Adelaide Brighton Cement placed this order for a Siwertell enclosed horizontal screw-conveying system to replace the belt conveyor arm on its existing cement and clinker loading facility. The new conveying system was needed to reduce dust emissions and increase the system’s loading capacity, especially for cement. 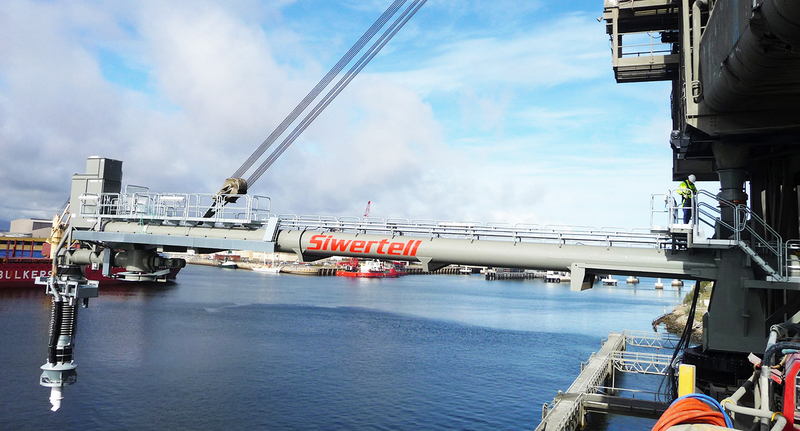 This was an unusual project for Siwertell; contracts normally call for the supply of complete, tailor-made installations. 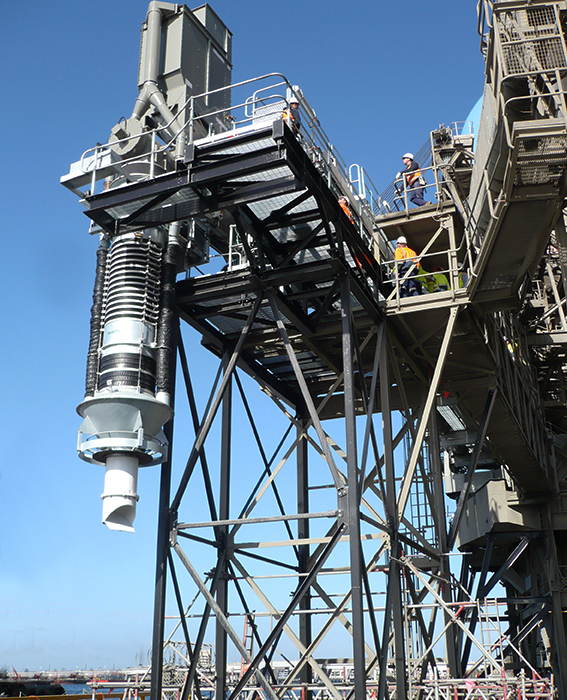 In this case, it was necessary to design and build a new screw conveyor loading arm and upper turret section to integrate with both the existing slewing ring tower support and the existing winch system. The inner horizontal screw conveyor has a length of 25.25m and the outer, slewing screw conveyor is 4.75m-long. The conveyor diameter is 700mm. Clinker is highly abrasive, so the screw flights are hard faced and the casing is fitted with a wear liner. While the rated capacity for cement is 900t/h, it is limited to 600t/h for clinker to reduce system wear. This is achieved by varying the screw conveyors’ rotational speed by means of frequency converters. The new loading chute can be placed directly onto the opening in a ship’s hatch cover or dedicated loading point. The length is automatically adjusted to accommodate changes in the vessel’s draft during the loading process. A dust collector maintains a negative air pressure in the enclosed system to avoid dust emission. Siwertell also delivered motor control cabinets in compliance with the relevant Australian standards. 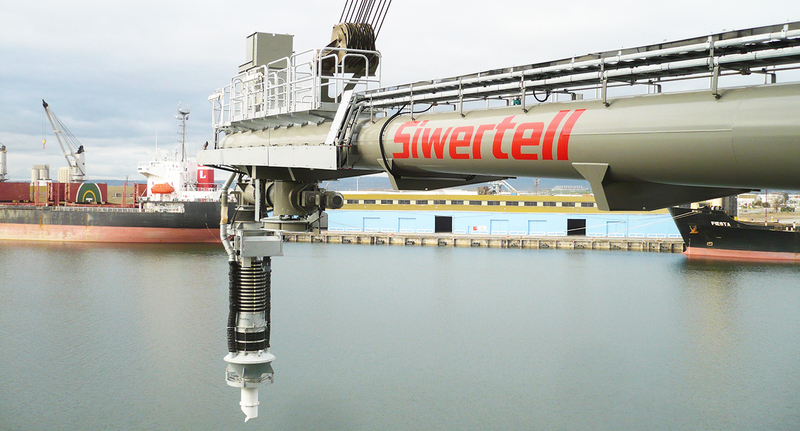 The system is controlled by the client’s PLC and HMI systems, either from the existing fully-equipped operator’s cabin or from the portable radio control unit supplied by Siwertell. The extensive engineering works were scheduled to coincide with a planned break in cement production for maintenance at other installations in the plant. The time available for dismantling the old belt conveyor arm, adapting the existing support structure and winch and installation of the new loader system was less than a month. Prior to installation the replacement units were completely pre-assembled on the ground to save as much time as possible.